There’s never been a better time to straighten your teeth with the most advanced clear aligner in the world. Our office is proud to be a certified provider of Invisalign clear aligners, which give you a clear, convenient, and comfortable option to achieve the smile you’ve always wanted. 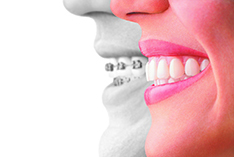 Please call our office today to schedule your FREE consult to discuss clear aligner therapy. At your initial consultation, we will discuss your orthodontic needs and evaluate whether Invisalign treatment is right for you. Invisalign consults are FREE!